Kids loves the renovated pool and arcade. Great service overall. Checked up on us via text within an hour of our check-in. Promptly gave us an extra blanket. 2nd time staying here. Will definitely return again! Amazing breakfast. Very friendly staff. Very clean facility. 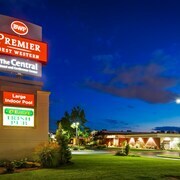 Where to find Harrisburg - Hershey hotels near an airport? 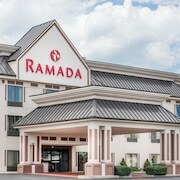 Where can I find hotels in Harrisburg - Hershey that are near tourist attractions? Harrisburg - Hershey has an abundance of first-rate hotel possibilities. If you are looking to stay within a 0.1-kilometre (0.06-mile) distance of the center of Harrisburg - Hershey, Expedia's comprehensive database features no less than 56 hotels and apartments in that area. Canny travelers who fully appreciate the many benefits of basing themselves close to the action should check out the latest deals at the Hilton Harrisburg and Crowne Plaza Harrisburg-Hershey, which are within 1 kilometre (0.6 miles) of Harrisburg - Hershey's downtown area. A good place to check out is Harrisburg. Harrisburg is 9 kilometres (6 miles) from the center of Harrisburg - Hershey and is home to 45 Expedia-listed hotels. The Homewood Suites by Hilton Harrisburg East-Hershey Area and Sheraton Harrisburg Hershey Hotel are some of the Expedia-listed accommodations here. Also popular with those exploring this area is Hershey which is an alternative Harrisburg - Hershey accommodation district that is 20 kilometres (12 miles) from downtown Harrisburg - Hershey. There are 17 hotel establishments in Hershey, including the Bluegreen Vacations at Hershey, Ascend Resort Collection and Fairfield Inn & Suites Hershey Chocolate Avenue. 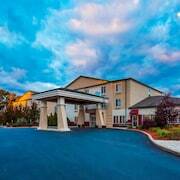 You could also find accommodation in Grantville, which is home to the Hampton Inn Harrisburg/Grantville and Holiday Inn Harrisburg - Hershey Area, I-81, or York, which is home to the Heritage Hills Golf Resort and Homewood Suites By Hilton York. Hummelstown is 16 kilometres (10 miles) from Harrisburg - Hershey's downtown, while Carlisle is 25 kilometres (17 miles) from the heart of Harrisburg - Hershey. 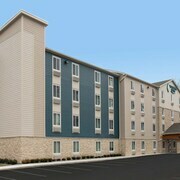 The Hilton Garden Inn Hershey and Hampton Inn & Suites Hershey Near The Park are in Hummelstown, while Residence Inn Marriott Carlisle and Carlisle House are situated in Carlisle. Of course, a trip to Harrisburg - Hershey wouldn't feel complete without a trip to the Hershey's Chocolate World. The SpringHill Suites by Marriott Hershey Near the Park and Hampton Inn & Suites Hershey, are all within walking distance of Hershey's Chocolate World. A popular option when you visit Harrisburg - Hershey is to stay near the Pennsylvania State Capitol. The SpringHill Suites by Marriott Harrisburg and the Staybridge Suites Harrisburg are each a short drive away from this often-visited attraction. Capital City Airport is a nearby airport for flying in and out of Harrisburg - Hershey. It is 5 kilometres (3 miles) drive away. 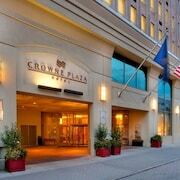 If you choose to stay nearby, try the Hilton Garden Inn Harrisburg East or Towneplace Suites by Marriott Harrisburg. What are the most popular Harrisburg - Hershey hotels? Are there hotels in other cities near Harrisburg - Hershey? What other types of accommodations are available in Harrisburg - Hershey? Explore Harrisburg - Hershey with Expedia.ca’s Travel Guides to find the best flights, cars, holiday packages and more!